12 Great Coloring Projects for Children of All Ages - Mummy's Gone Mad! | Mummy's Gone Mad! No matter what the age of your kids, coloring is a wonderful way to keep their young hands and their young brains, occupied. Kids love to color, and creating their own artworks can provide a real sense of accomplishment. 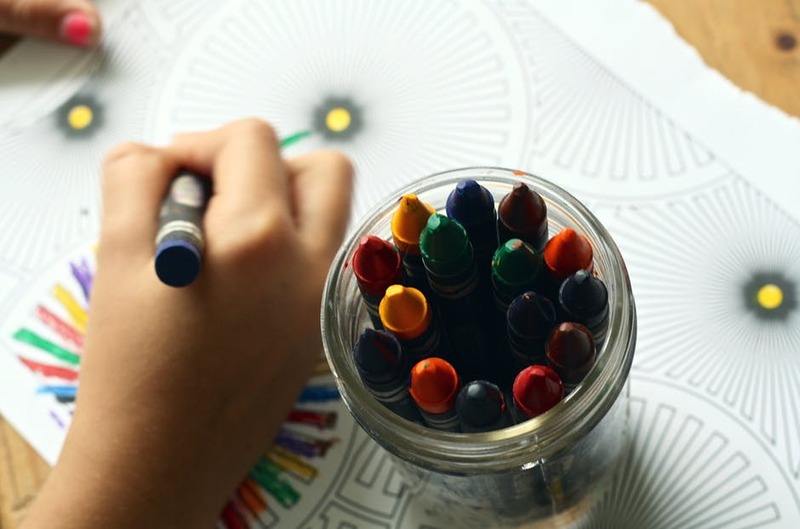 Whether you are spending a raining day indoors or looking for something to do on simmer break, these to coloring projects will keep your kids busy and engaged. There is nothing like a good old coloring book to spark the imagination and creativity of children everywhere. The simple act of coloring provides endless fun, and the results are perfect for refrigerator framing. Whether you choose simple designs and swirls for the younger kids or more complicated creations for the older ones, the whole family is sure to have a great time with coloring pages. The great thing about watercolors is that they are suitable for kids of all ages. Even the youngest kids can put paint to canvas (or paper), and as they get older, they can continue their love of art and create some truly exceptional works in the process. Watercolors are easy to use, cleanup is a snap, and the kids can find paints in every color of the rainbow. Mealtime will be a whole lot more fun when everyone knows their place, so grab some plain white placemats and let the kids express their creativity. When these pieces of practical art are complete, you can have them laminated for durability, protecting them from the inevitable spills and stains. Practical items are always fun to paint, and there are plenty of fun kits that come complete with plain white mugs and caps, as well as the watercolors, markers and glitter needed to decorate them. Once the kids tackle those projects they can continue their artistic endeavors with plain store-bought mugs, cups, bowls and whatever else you want to provide. They may seem cheesy to adults, but paint by numbers kits are perfect for kids Great at developing hand/eye coordination and just as great at creating color awareness, these formulaic artworks are the perfect introduction to painting for young children. The older kids can find more challenging kits, and everyone will be proud to frame and display the results. Kids love to grow plants and flowers, and they also love to color. Your kids can combine both those passions by decorating plain flower pots with their favorite watercolors and oil-based paints Just pick up a supply of suitable flower pots hand the kids their paints and paintbrushes and let them take it from there. When the project is done, you can help the kids plant flower seeds and display the results in a nearby windowsill. If your kids need a new toy box, buy a plain wooden box and let them decorate it in their own way. Just grab some fun stencils, a few sets of stickers and a set of watercolors or oil-based paints. The kids can have hours of fun decorating their new toy 13°,5 and having such a pretty storage container can encourage them to put their toys away. Making jewelry is always fun, but coloring your own pendants, bracelets and earrings is even better. Parents can buy ready-made kits that include the jewelry pieces, paint and other supplies, or they can buy the pieces separately and let the kids use their own imagination. Whether they Ove the jewelry as gifts or wear it themselves, these homemade creations can provide a real sense of accomplishment for young hands and minds. Finger painting is as old as humanity, and you can see the works of young artists long dead on cave walls around the world. If you have kids you can bet they long to finger paint, but you probably do not want them painting the walls of your home. Finger painting kits provide the perfect compromise, giving young artists the outlet they need while preserving the sanctity of your home. Don’t throw that bubble wrap away the next time that Amazon package comes in the mail. Rill it out and hand it to your kids instead. Bubble wrap paintings are great outlets for childhood creativity, and the unique shape and size can produce some impressive resifts. Whether they pop some of the bubbles first or paint it as is, the kids are sure to have a fun afternoon. If your kids are not big fans of bath time, just add some paint. Bathtub friendly paints are lots of fun, and a great way to encourage your kids to scrub themselves clean. Pretty soon, your kids will be begging for time in the tub instead of avoiding bath time like the plague. You will want to use food color instead of paint, but making colorful ice cubes is the perfect rainy day art project. Just grab the aforementioned food colorings, a couple of ice cube trays and let the water run. When the freezer does its work, the whole family can enjoy their drinks with a rainbow of icy colors Kids love to color, and coloring is a wonderful way to spark creativity and let young minds run free. Whether you are entertaining the kids on a rainy day, prying them away from the TV or just looking for something to do as a family, the 12 coloring projects listed above can be lots of fun.